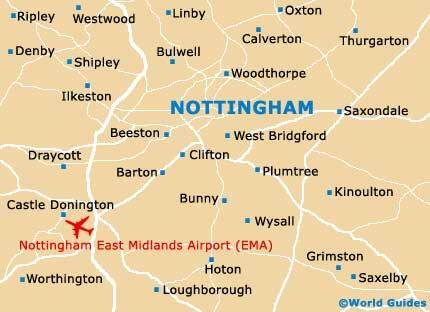 As with many other large cities in the Midlands, much of central Nottingham is divided into distinct areas and districts by a busy inner road, which encircles many of the main attractions and sights. 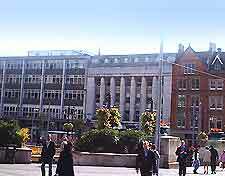 Nottingham boasts two separate bus stations, the Broadmarsh bus station on the southern side of the city, and the Victoria bus station to the north. Those arriving by rail will find Nottingham's train station to the south of the city's canal and just a short walk from the heart of the action. Here are Nottingham's most prominent districts, locations and neighbourhoods. Famed for its fashion boutiques, the Bridlesmith Gate area of Nottingham is a long cobblestone street, which links both St. Peter's Gate and the Low Pavement. Many of the shops in this bustling spot feature Victorian-style facades and spacious interiors. One of the most acclaimed shops here is Sir Paul Smith's original fashion store, located along Byard Lane. Lying in the very heart of the city, the Old Market Square is one of the country's biggest public squares and is often home to many of the city's liveliest and most colourful markets. Recently redeveloped, the Old Market Square also hosts a number of seasonal events and celebrations throughout the year, particularly during the busy summer months. The square is surrounded by many well-known chains of shops and department stores, such as Debenhams, with intersecting streets including Angel Row, Friar Lane, Long Row, Market Street and Queens Street. Two stone lions stand on the eastern edge of the Old Market Square, close to the grand Council House, and are believed to be the guardians of Nottingham city. Other attractions here include the tourism centre, a good selection of restaurants and several great nightspots. An appealing district known for its cosmopolitan atmosphere and diverse mixture of independent shops and retailers, attractions in the Hockley area of Nottingham include the Broadway media complex along Broad Street, which contains the smallest cinema in the whole world - 'The Screen Room'. The Lace Market region can be found directly next to Hockley and was once the city's historic centre for lace making. Around the neighbourhood are a number of Georgian-style houses and building, converted warehouses and bars. Fine dining abounds in this part of Nottingham, while other highlights include Sneinton Market, the National Ice Centre, and the Gusto Food Hall delicatessen along Gedling Street. Derby Road is a great place to visit if you are looking for shops with a difference, away from the morea usual, commonplace high-street shops, close to the Old Market Square. At the top, the district is known as Canning Circus and contains plenty of traditional pubs and eateries, serving hearty lunchtime specials. There are plenty of places to park your car around Canning Circus.